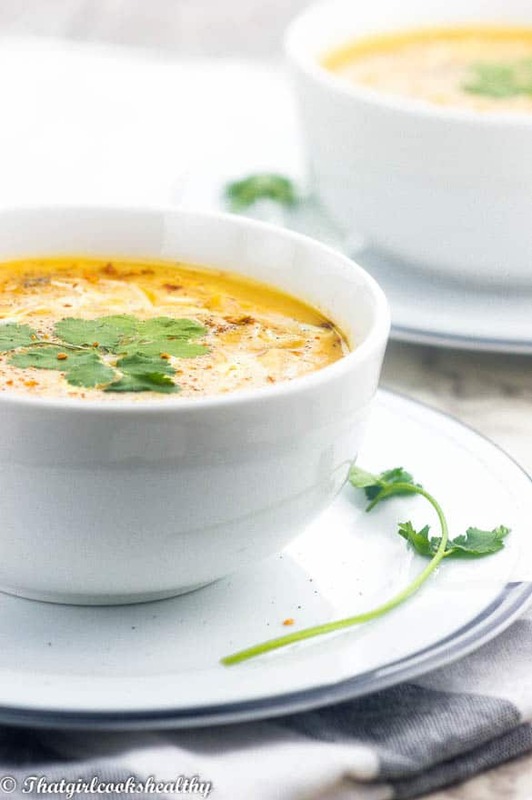 Carrot and red lentil soup recipe – A thick and creamy vegan legume based soup generously infused with ground coriander spice. While winter is still at it’s peak, many of you are probably seeking some comfort food. I love comfort food because it keeps my tummy full and mood content. However, soup is a sad reminder of how cold the weather is outside. Therefore, in a sense I feel this notion is a catch 22. Well regardless of how I or yourself may feel, winter is here. Unless you live in a hot and sunny environment. The other day as I went to my local supermarket. I went there just to browse at what bargains were to be had. When it comes to purchasing legumes i.e lentils, kidneys beans, pinto beans I aim to bulk buy. Speaking of which, I wrote and article in my early development of blogging which talks about this. To summarise the post highlights the importance of shopping on a budget . I would highly recommend sparing at least 5 minutes to read it, if possible. Especially you are looking to save yourself some pennies in your purse. I brought a huge bag of red lentils for roughly £2 (approx $3-4) which was a BARGAIN. This bag will last me a long, long emphasis on long time. I subsequently brought some fresh carrots as I immediately thought of how complimentary carrots are to red lentils. Lentils, particularly red ones because they disintegrate rather quickly, work well in pureed soup. On the other hand, carrots are thick when pureed with a slightly sweet taste. One of the core reasons why this duo work so incredibly well together is flavour and texture. Then add a teaspoon of ground coriander to the mix and that equates to food heaven. Just the warmth alone will tantalise your taste buds. 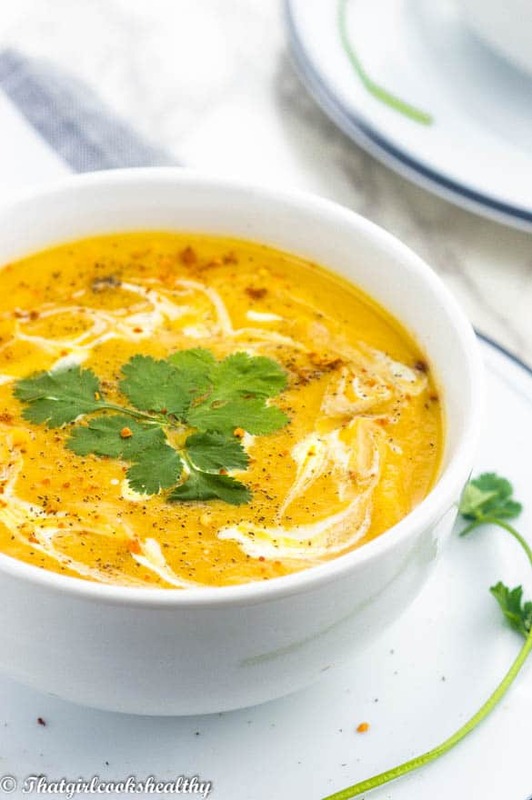 Ultimately, would describe this carrot and lentil soup recipe as subtly sweet with warmth and a protein powerhouse to boot. Who said you need meat to load up on protein, eh? All you need is a good sturdy saucepan to simmer the veg and legumes along with a powerful blender. Alternatively, you can use stick (immersion) blender if you don’t own a vitamix or blendtec. When I made this soup, I pureed everything into a smooth consistency but you can pulse – stop and start if you like yours chunky. Due to the generous use of stock, I didn’t measure the amount salt and pepper I used, I added what I needed accordingly to my preference so please feel free to do the same. Melt the coconut oil in a small frying pan and proceed to sautee the onion until translucent then set aside. Add the lentils, carrots, onions, vegetable and almond milk to a large saucepan and bring to a rolling boil. Reduce the heat to low-medium, stir and season with salt, pepper, ground coriander and chilli. Stir once more time before covering the saucepan with the lid then simmer for 20 minutes. During that time the carrots and legume will start to break down and soften. If using a high speed blender, carefully and very slowly pour the ingredients into the blender. Be mindful of any hot splash back. Work in batches if required and puree into a smooth consistency. For an immersion blender, you can puree everything by hand in the same cooking pan. 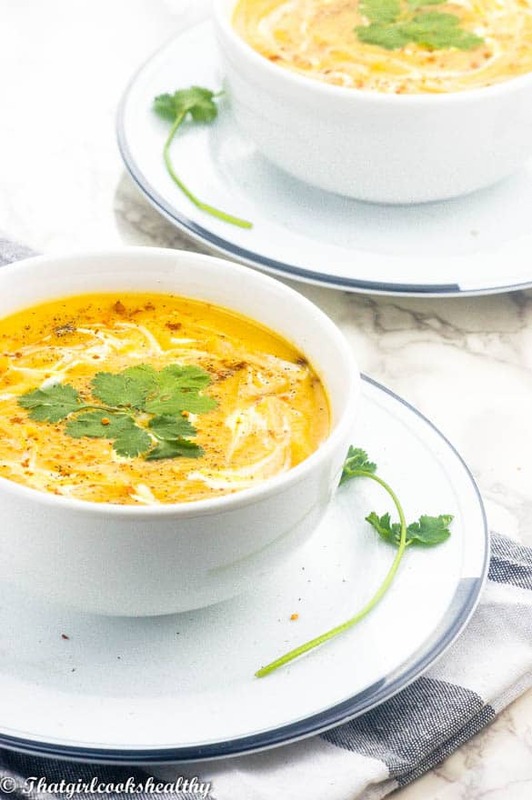 Really love this soup especially when the weather is miserable in the UK! This looks so creamy and delicious, I can’t wait to try it! Agreed, this cold weather definitely makes me crave comfort food! 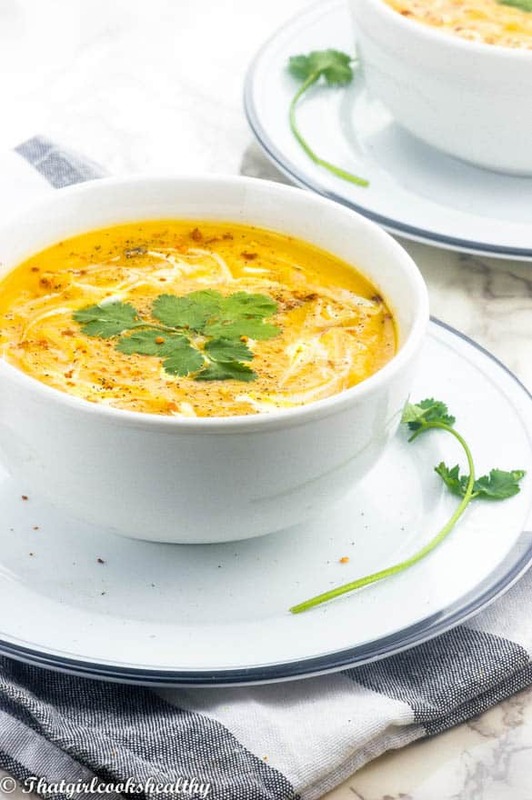 Love how warm and hearty this soup is! I so need this today! Perfect comfort food. I really need to buy lentils more often. Thanks for the inspiration! I had a vegan carrot soup in London I have wanted to try making at home, I can’t wait to try your recipe and see how it compares. Oh wow, this looks super yummy! I really wanna try it, with the cold weather, this will be amazing! You are most welcome. I bet the soup will pair nicely with your homemade bread.